I wanted to refinance my house so I could reduce my monthly payments and consolidate some debt. I went online to find some information. Shortly after I typed my phone number in the website and before I could look at the information on refinancing, a loan broker called me. He started in on a high pressure sales tactic as to why his company was the best and what he could do for me and how helpful it would be. I just wanted to get information. He wanted me to give him all my financial and banking information over the phone and he would email me something to sign. The more I asked questions, the more urgent he was that I sign right away. It was getting late and I told him I would think about it and get back to him in the morning. I felt a lot of pressure to sign that night and wondered if I made a bad decision not signing right then. I prayed and asked God to guide me in making the decision. The next morning it was clear to me that I should call my bank. They were helpful and gave me all the information I needed. Plus, they could save me more money per month and in the long run than the broker from the night before. I felt peace about the decision and knew if was God that had directed me. God is never in a hurry. When we feel rushed and pressured to make a decision without a deep confidence of inner peace, it is probably not God. The Bible says God is not a God of confusion, but of peace (1 Corinthians 14:33). When trying to discern God’s voice, remember He is not in a hurry and will not cause more confusion in our situation. He brings peace. If we do not have His peace about a decision, we should probably not do anything until we do. Have you ever felt rushed or pressured to make a decision? Did you make the decision and regret it? Or did you wait for God’s peace and timing? ***This is Day 21 of the series 31 Days of Hearing God. I am joining others in the October writing challenge at write31days.com. To read more in this series click here for all the topics. I love this reminder. especially in a world that is always in a hurry and always frantic. God is neither! Yes and I forget that Michele. I love this so much. You sought counsel from THE COUNSELOR!!! Yay, wisdom 101!!! Beautiful post and I've had the same experience - it took me all the way to the cost of an appraisal before I knew to "flee." But all turned out well. Thank you Lord for Your grace on deposit. Yes! So true. Thanks Susan. Beautiful! I have had the broker situation before myself. 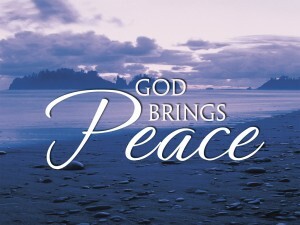 God will bring peace when we hear his voice not confusion. Such a wonder and thank you for sharing 1 Corinthians 14:33 to affirm this. Blessings! Thanks for stopping by Mary! God is not a God of confusion but of peace, so if my decision brings no peace, it's probably wrong. My best take-away from the day. I've had this experience, but felt like I was just going on 'gut-instinct'. Looking for God's peace feels so much better! Good! That is my take-away too. Thanks Carol! What excellent advice! We've made split-second decisions before (when we bought our first vehicle 26 years ago--which we still own and it still runs great), and realized afterwards that we could have gotten a better deal if we would have waited. Sounds like you got a pretty good deal if it lasted 26 years! This is so good. What a great story to use as an example of how God is with us. I have felt pressured from other believers in a similar way, and you are right, that isn't from the Lord. Excellent reminder that God is not a God of confusion. I really appreciate this message. I'm so glad Natalie! Thanks for stopping by! Great reminders! Ah...peace. I love it when God gives me peace about a decision. And it is so encouraging to know that He is never in a hurry. Thanks for sharing! "God is never in a hurry. When we feel rushed and pressured to make a decision without a deep confidence of inner peace, it is probably not God." <-- yes! great reminder! Do You Really Want to Hear From God? God or Genie in a Bottle? How Do We Know God's Voice? What Do You Say to Someone Who Gives You Their Child? Day 26-What is Your Happiness Set Point?